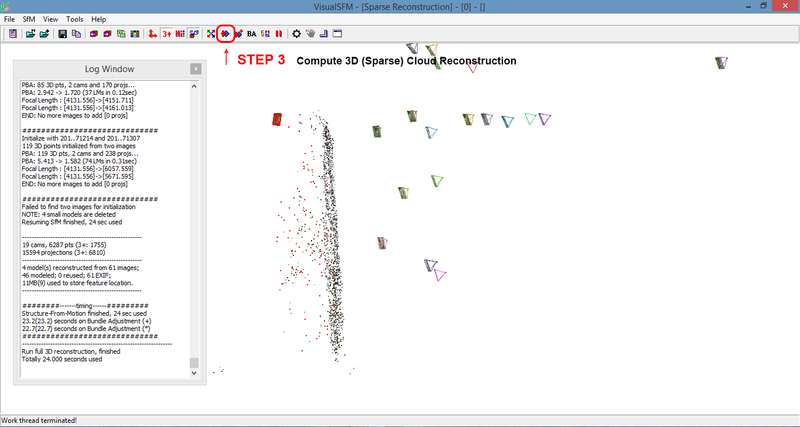 VisualSfM is a GUI application for 3D reconstruction from structure from motion [Changchang 2011]. Open-source, free for personal, non-profit, or academic use, it allows you to upload a series of photographs and turn them into 3D models. I downloaded Visual SfM, and the Multicore Bundle Adjustment, a series of other small programs you need to run Visual SfM. In order to create dense point clouds, you need these extra code/programs, as they run the dense matching and point cloud generation on larger sets of images. However, I found the instructions difficult to follow, and Visual SfM did not work for me the first time round. After several searches, eventually, I found an excellent tutorial Make a 3D Model from Pictures on Instructables, a website for fans of DIY, to share videos and instructions on what they have made. In his tutorial, JuiceW, has the most clear instructions on how to install all the various components, and with direct links to them. If you are a member of Instructables, you can download the instructions as a PDF, otherwise, you can just view them on the screen. Once I have all the software downloaded and installed, I began the program. I created a series of screen-shots of the process, to help chart the way. Firstly, I took a series of photographs of one of the Ogham Stones at Cólaiste Íde, in Burnham. (I have described Burnham house in a previous blog post, you can view it here). To properly create a 3D model from photographs, it is recommended you use a lot of photographs, 50 or more. For the purpose of testing out Visual SfM, I used less than half of that. The process can take a while depending on the size of the random-access memory (RAM), the computer data storage, and I wanted to explore and learn how to use the program, with a minimum of ease, before embarking on a larger scale project. The first step is to open the Visual SfM program. Just note, there is a smaller, separate Log Window, where you can see the process in action. This Log Window, has a habit of disappearing, and if it does, don’t panic! Firstly I move it to the left of the screen, it seems less likely to disappear while there. Another way to check the Log Window is open; just under File, you will see a page icon, this will Show/Hide Log Window. You can see in the Log Window, all the image files being uploaded. It will tell you when it is complete. The next step is to match the images. You will do this by pressing the icon Computing Missing Matches that has four arrows in each direction, and each a different colour. In next step, the program will begin to find all the relevant matching points between the images and start creating the 3D construct, calculated for their 3D positions in a relative coordinate system. To start this process, click on the Sparce Reconstruction button. This button looks like two arrows on top of each other, the foreground one is red, the background one is blue. The 3D structure that is being reconstructed from the series of 2 D images. The Sparce here refers to a sparse set of points and lines on the object surface: the process of inferring sparse 3D structure of a static scene from a moving camera. [SMALL Project, 2016]. 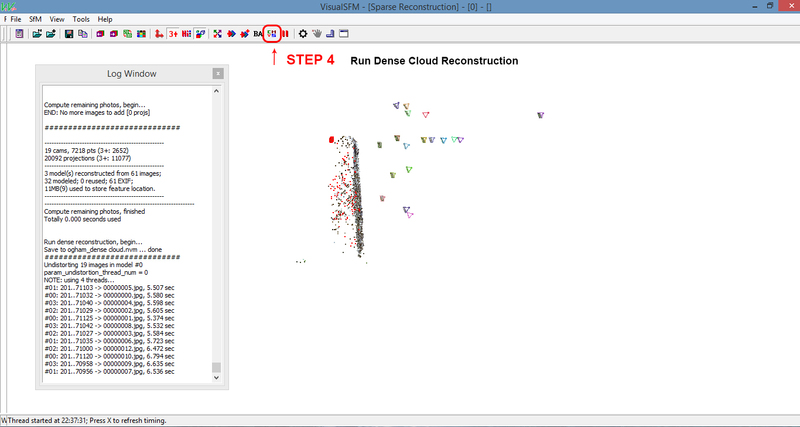 After you have completed your Sparse Reconstruction, the next step is to create the Dense Reconstruction, or CMVS. When you click on the CMVS icon, a new window will open, and ask you to name the data files, or created cloud point, and the location you want to save it. Once you have chosen, you will see the relative process of dense reconstruction in the Log Window. This may take some time, depending on the quantity of images. CMVS was developed by Yasutaka Furukawa, who like Wu Changchang, was also a postdoc at University of Washington. Many multi-view stereo (MVS) algorithms do not scale well to a large number of input images due to the lack of lack of computational and memory resources. 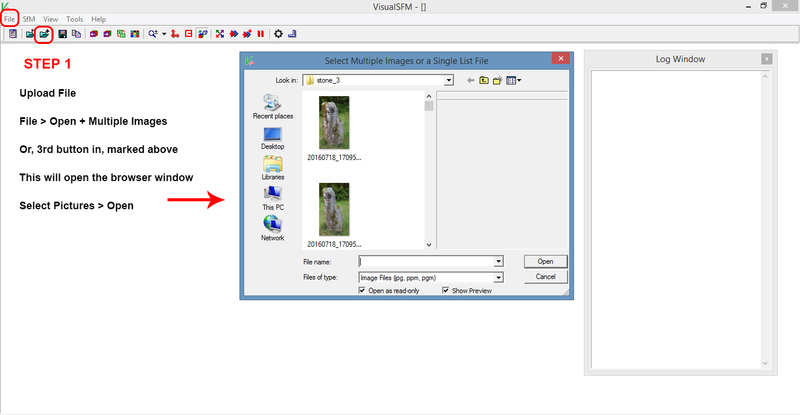 This software (CMVS) takes the output of a structure-from-motion (SfM) software as input, then decomposes the input images into a set of image clusters of manageable size. [Furukawa, 2010]. He also developed PMVS, which is usually now included in the CMVS package. 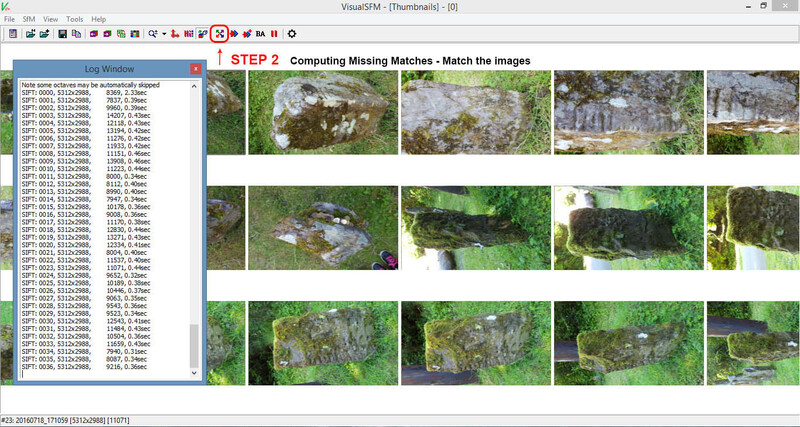 PMVS is another MVS; it takes a set of images and camera parameters, then reconstructs 3D structure of an object or a scene visible in the images. Only rigid structure is reconstructed, in other words, the software automatically ignores non-rigid objects such as pedestrians in front of a building. 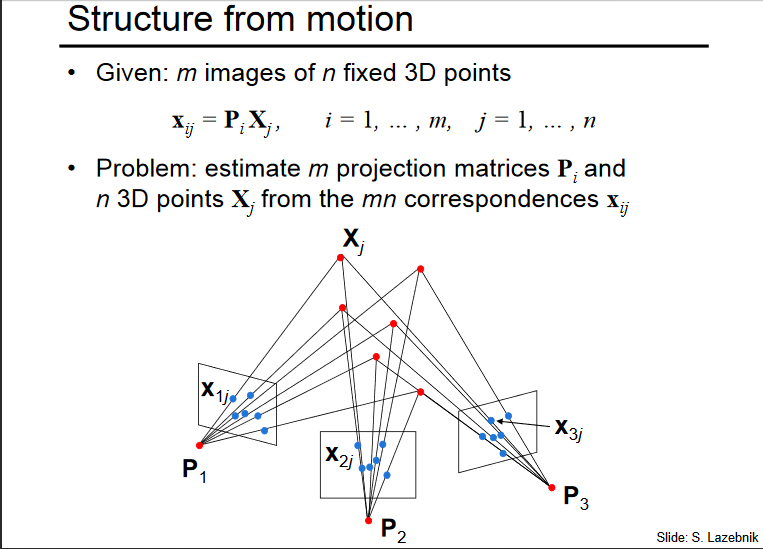 The software outputs a set of oriented points instead of a polygonal (or a mesh) model, where both the 3D coordinate and the surface normal are estimated at each oriented point [Furukawa, Ponce, 2010]. The final step in Visual SfM, is to save the file. This is done, by clicking on the SfM icon, scrolling down to Save NView Match. Click on this, give the file a name and then save. 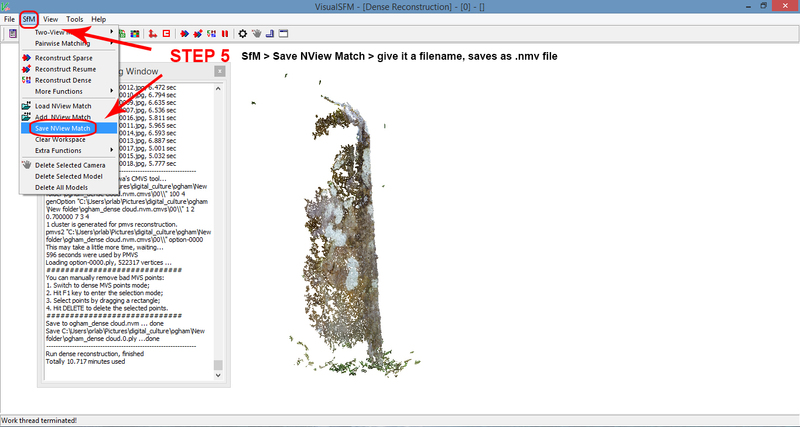 VisualSfM saves SfM workspaces into NVM files, which contain input image paths and multiple 3D models [Furukawa 2010]. NVM are essentially text files, and could be opened with a text editor, such as Notepad, but because of the huge quantity of 3D points, it would crash it. The next step is now to open up the file in MeshLab, which, again, is an open source program you can use in the construction of 3D models. I wont be going to MeshLab just yet. The 3D model I made, in this example, is not of great quality. As I said previously, I wanted to test out the program, and see how long it takes for just a handful of images to work. Also, the processing system; would my laptop be able to handle it, and is it possible to work on other things, while the program is running. It is interesting to use the program just to get an idea of the kind of photographs that need to be taken. What you look for in a ‘nice’ photo, is not what you want for a photogrammetry exercise. The greyer the day the better, with minimum amount of light variation. Also, making the ‘object’ as full in the frame as possible, cuts out on other potential unimportant points. I will update the blog, as I learn more about Visual SfM, on tweaking images, deleting unnecessary points, etc.